Are there any CubeSats that have been launched into Geostationary (GEO/GSO) or Geostationary Transfer Orbit (GTO)? There is one mission by GSFC/NASA - Shields-1 to be launched into GTO. Apart from that I couldn't find any other mission to GTO/GEO. It would be of great help if there is any information on this. No cubesats have yet been launched into GEO or GTO. 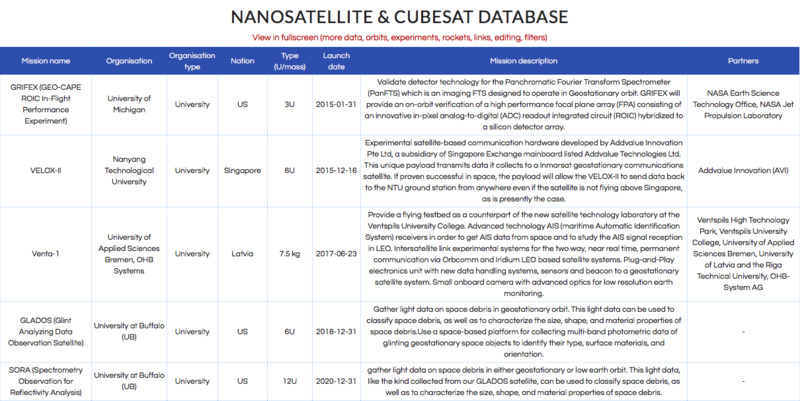 Used the database suggested by Matthew, which is a wonderful database - World's largest database of nano satellites. Here are the lists of CubeSat missions planned for GEO and GTO. SpectroCube - 3U CubeSat by ESA, planned to be launched in Dec. 2020. GTOSat - 6U CubeSat by GSFC, NASA planned to be launched in Dec. 2020. LACCE (LousianA Coronal mass ejection Correlation Experiment) - 3U CubeSat by Uni. of Lousiana, Lafayette. ADE (Aerodynamic Deorbit Experiment) - 3U CubeSat by Purdue University. DSM-BRAC - 2U CubeSat by Uni. of Michigan. The last four CubeSats are the winning entries of ULA's STEM education program. They get to hitch-hike to GTO for free! I have done some research, and I believe that there have been 5 CubeSats that have been launched into Geostationary Orbit. I have put all those 5 CubeSats together with all the information I found. Not the answer you're looking for? Browse other questions tagged spacecraft cubesat geostationary or ask your own question. Will Juno record its deorbit?